The Competition directorate of the European Commission, lead by Joachim Almunia, has started an in-depth analysis of the proposed merger between the German mobile branches of Telefonica and KPN. The procedure, so called “Phase II” under the merger rules, will analyze in details the effects of the merge in the German market and may bring to whatever result, including banning the transaction or imposing some remedies (including structural or access remedies). The Commission will have to take a decision by May 14. No official news are available by the European Commission. The start of the Phase II is not a good news for big telcos in Europe that, by contrast, are going around asking for relaxation of merge rules, in order to allow more consolidation. According to them (recently Vodafone’s CEO Mr. Colao in Barcelona) an enhanced concentration of the telecom market will allow more investments. The move from Almunia is not surprising. 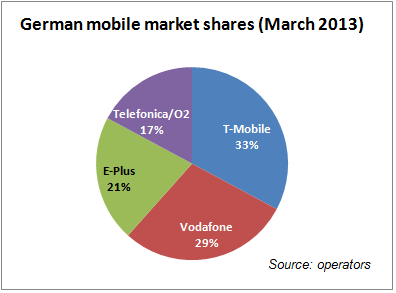 The EU institutions are not against consolidation in the mobile market, if this is a result of efficient market dynamics. However, merge rules have to contrast mergers aiming at reducing competition in a given market. This is why Mr. Almunia is considering seriously mobile mergers taking place within members states, because such deals end up simply with the reduction from 4 to 3 operators and subsequent reduction of competition. Instead, the offices of DG Comp will see favorably cross-borders mergers (i.e. deals concerning companies operating in different countries) because such transactions would lead to the creation of big pan-European operators able to compete at international level. By contrast, the simple merge between national players is not going to provide any benefit to European integration: rather, it will be a deal permitting the operators left to better coordinate their commercial policies to the detriment of consumers and competition. This is particularly true when the acquired company is the so-called “Maverick” operator, i.e. the company being more dynamic from competitive point of view. The disappearance of such operator may be seen as a move to make stop competitive offers in the market, rather then looking for synergies or cost reductions. Because of the above, the European Commission took a serious approach vis-à-vis a merge in Austria between Orange and Hutchison in 2011, which was approved only after deep analysis and imposition of remedies. For the same reasons, last year the US antitrust authorities objected the possible merge between T-Mobile and AT&T in the US market. European telcos will probably complain about the approach taken by Almunia, however they should recognize the the path indicated by European institutions is clear: green light for cross-border merges and M&A, likely stop for pure national consolidation transactions. ← The Netflix/Comcast deal: nothing to do with Net Neutrality?